As much as I love the flavors of fall, after all that pumpkin baking, I needed a little break. And no surprise, I was craving something chocolatey! My first thought was a big pan of chewy, fudgy brownies (because, truthfully, when am I not in the mood for brownies?) but in the end I decided to go in a different direction and try this Chocolate Chunk Coconut Cake. 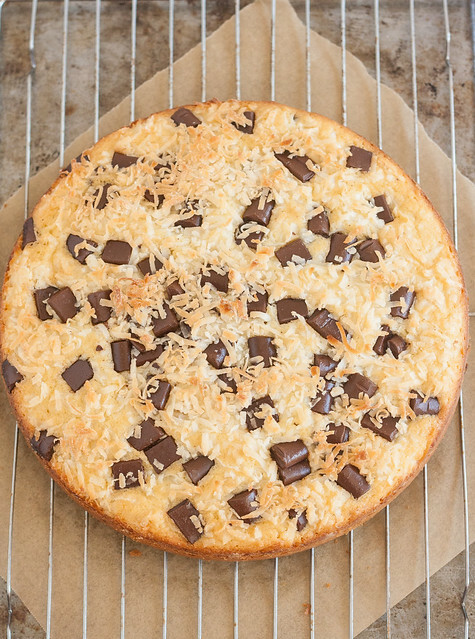 I’ve had it bookmarked forever, and I just adore the combination of coconut and chocolate so I had a feeling this one would be a winner. This is a no-fuss, simple one layer cake – perfect for those times when you want cake but don’t want to mess with lots of layers, fillings, and frostings. It has so much going on you won’t miss any of those things, promise! The coconut flavor in the cake comes not only from the shredded coconut mixed into the batter and sprinkled on top, but also from the use of coconut milk in the cake itself. Oh, and there’s also the coconut glaze drizzled over the finished cake as well. It’s pretty much a coconut lover’s dream! Chocolate chunks are distributed throughout the cake and on top so it’s not lacking in that department either. The combination is very reminiscent of Mounds Bars, so good! Preheat oven to 350 F. Butter and flour the bottom and sides of a 9-inch springform pan (a regular 9-inch cake pan should be fine if you don’t have a springform – just make sure the sides are at least 2″ high). In a medium bowl, whisk together the flour, baking powder, and salt. Add 1 cup of the coconut and toss to combine. In the bowl of a stand mixer fitted with the paddle attachment, cream the butter and sugar on medium speed until light and fluffy, about 3 minutes, stopping to scrape the sides of the bowl once or twice. Add the eggs one at a time, beating well after each addition, then stir in the vanilla and coconut extracts. With the mixer on low, alternately add the dry ingredients in three additions, and the coconut milk in two, beginning and ending with the dry ingredients, and beating just until combined. Use a rubber spatula to fold in 3.5 oz of the chocolate chunks. Transfer the batter to the prepared cake pan and spread in an even layer. Distribute the remaining chocolate chunks evenly over the surface of the batter, then sprinkle the remaining 1/2 cup of coconut on top. Bake for 45-50 minutes, or until a toothpick inserted in the center comes out clean. You might need to tent the pan with aluminum foil to keep the coconut on top of the cake from burning – I tented my cake at about 35-40 minutes. Remove the cake to a wire rack and allow to cool completely in the pan. If you used a springform pan, remove the sides of the pan (or if you used a traditional cake pan, turn the cake out of the pan then flip it back over so the coconut is on top). To make the drizzle: Whisk together the confectioners’ sugar, coconut milk, and vanilla in a small bowl. Drizzle over the surface of the cooled cake. (I didn’t use all of the glaze, but it’s up to you how much you want to use.) Allow the glaze to set for a few minutes before slicing and serving the cake. 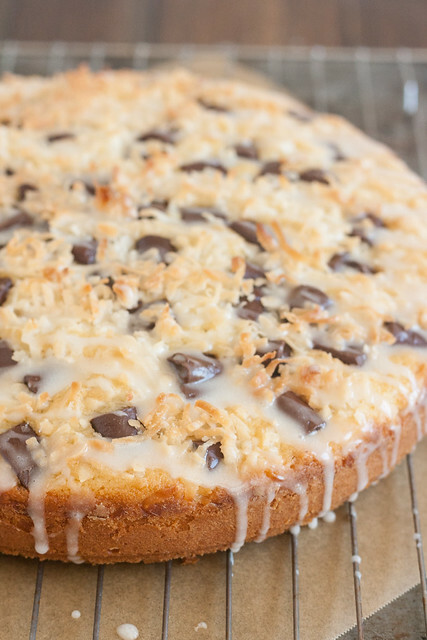 20 Responses to "Chocolate Chunk Coconut Cake with Coconut Drizzle"
Holy moly Tracey, this looks SO amazing! 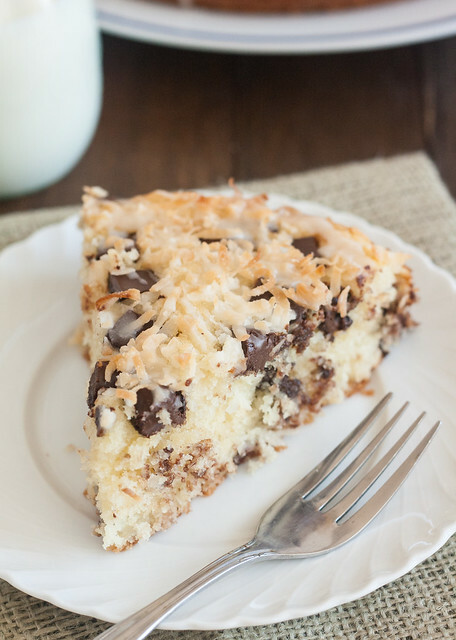 I love the combo of chocolate + coconut so I know i’d adore a big slice of this. NOM! LOVE this cake! Coconut is one of my favorites! Can’t wait to see all the pumpkin goodies you’ve been whipping up! I am enjoying all of the pumpkin and apple creations but my true love is chocolate. This cake is like a dream come true. Loved having this waiting on the counter for us when we got back late from our trip! The cake was moist and delicious and those chocolate chunks just burst in your mouth. Loved the coconut, too. I was looking forward to another slice as I was driving home from work today!!! 🙂 Ooh it’s so good! Thanks again, Tracey. Love everything about this cake! 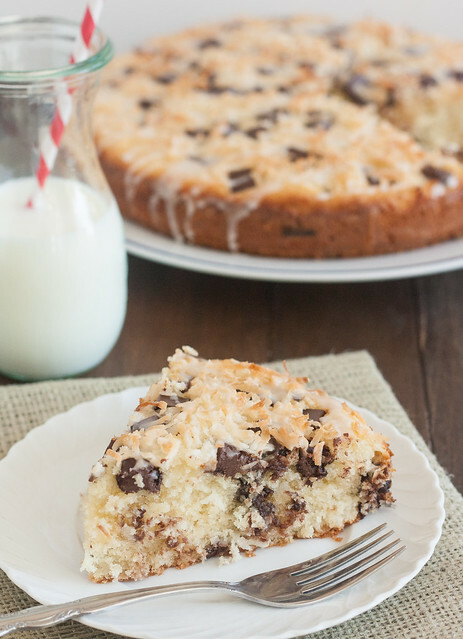 Chocolate and coconut is one of my favorite combinations! This is my kind of chocolate chip cake, Tracey! I adore anything coconut. Beautiful photography here, too, with that last close-up shot. I’m drooling! Pinned! This cake is SUPER pretty and I love that it’s semi-simple and looks SO delicious! Earlier this year I became vaguely OBSESSED with the chocolate/coconut combo! It’s just the best, actually. And it’s also pretty awesome how quickly this cake comes together! Easy peasy. Oh wow! I love this so much 🙂 coconut cake is one of my favorites! Instead of butter could I use organic virgin coconut oil? @Anonymous: I haven’t tried so I can’t say for sure. If you do, I would use it at room temperature so it’s the texture of room temperature butter (as opposed to melting it). Let me know how it works out if you try!